My old M1 carbine ate the Aguila ammo with no complaints. Had one jam (not due to ammo) but scope being mounted too close to the ejector port. I buy lots of Aguila 22LR with equal good luck. I've been to the Mex facility and it's quite modern. Took this out in an old M1 Carbine, had no failure to feed, no failure to extract, no failure to fire in 100 rounds. Only potential issue is it does fire a bit 'dirty', but not too much more than most rounds I've fired and cleaning isn't much more extensive. These rounds are good quality, and are certainly worth the cost. 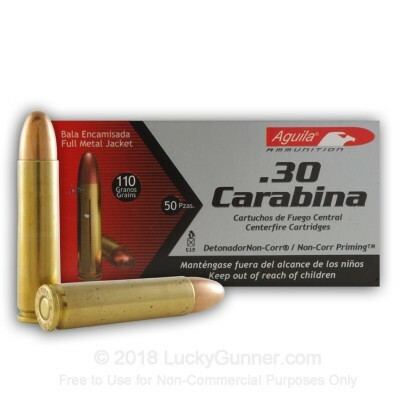 The 30 cal carbine round is pretty hard to find most places, and these are good for all-round use. I would offer my recommendation as they are worth a try. So good I intend to purchase more. Timely Shipment. First 4 shots into a 2" hanging plate at 75 yards. No misses. Next 20 into a 12" hanging plate at 100 yards. No Misses. No failures. Will get more. 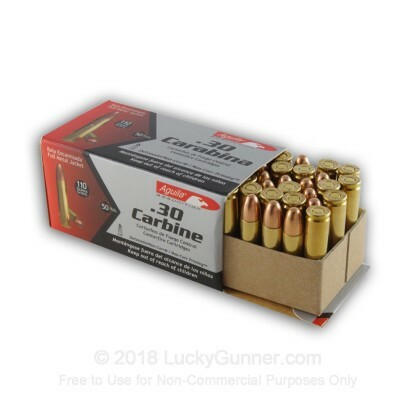 Great Ammo for the price on the 30 cal. Great Ammo at a great price and I will be ordering more as well as other cal. One of the few places I could even get the ammo!!! Great product great price!! 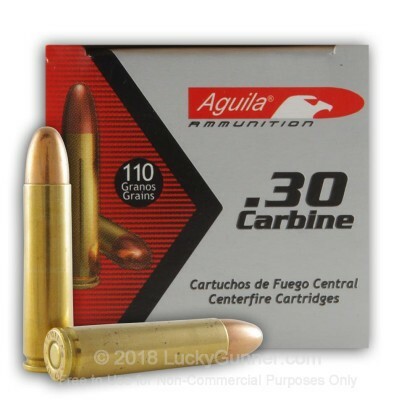 I have used this ammunition before and found it to be very good quality ammo. It seems to exit my barrel just a little bit faster than others so there is more imapct on the target/small game. Buy it and it's reloadable also. It is good ammo shoots well, good price.